BEIJING (Reuters) - China will allow large-scale pig farms and breeding farms to test for African swine fever in a bid to help early detection of the disease, overturning an earlier prohibition on commercial firms carrying out their own testing. 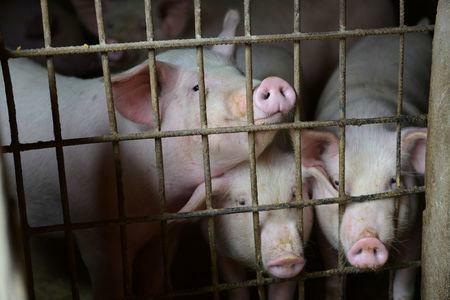 The move comes as China struggles to control the epidemic, which some analysts predict could see up to 200 million pigs die or be culled this year, causing a huge shortage of pork in the world's top producer. The change would help in the "early detection, early reporting and early handling" of African swine fever, reducing the risk of it spreading through transport, slaughtering and processing of infected pigs. Prior to diagnosis, farms should isolate pigs and other potentially infected items, and positive samples should also be retained and not used for further tests without the ministry's approval, it added. While the agriculture ministry has repeatedly said the disease is under control, the statement noted that "the awareness of epidemic prevention in pig farms in China is generally weak." It added, "the overall level of epidemic prevention is low, and the cleaning and disinfection measures are difficult to fully implement".